Iraqi special forces stormed the Mosul University complex in the city’s northeast on Friday and pushed Islamic State back to reach two further bridges across the Tigris river, the military said. The militants were fighting back at Mosul University, which they seized when they took over the city in 2014. A Reuters reporter witnessed heavy clashes inside the campus, reports Reuters. Iraqi forces have recaptured most districts in eastern Mosul in nearly three months of a U.S.-backed offensive, which accelerated at the turn of the year with new tactics and better coordination. They aim to take full control of the eastern bank of the Tigris river, which bisects Mosul from north to south, before launching attacks on the west, still fully in Islamic State hands. Driving the ultra-hardline Islamist group out of its Mosul stronghold will probably spell the end for the Iraqi side of the caliphate it has declared, stretching into Syria. By late on Friday, Iraqi elite forces had taken control of part of the university complex and reached two more of the five bridges that link east and west Mosul, Sabah al-Numan, spokesman for the counter-terrorism service (CTS) said. “God willing, in a very short while we will announce the clearing of the entire left bank … there are not many areas left (under IS control) on this bank,” he told state television. Iraqi forces have now reached Mosul’s three southernmost bridges, having battled their way to the Fourth Bridge several days ago. Senior CTS commander Sami al-Aridhi said the university was the most important Islamic State base in the eastern half of the city. “Forces are heading into the depths of the university,” Aridhi said early in the day, after bulldozers smashed through a wall surrounding the campus and dozens of CTS troops sprinted through carrying rocket-propelled grenade launchers. An Iraqi officer said army units backed by air strikes had also taken control of Hadba district, north of the university, and would aid the assault on the complex. Another CTS commander said the capture of the university would enable further advances as it overlooks areas closer to the river. Advances by Iraqi forces have gathered pace in the last two weeks after troops got bogged down in fierce street fighting in late November and December and militants hid among the civilian population. 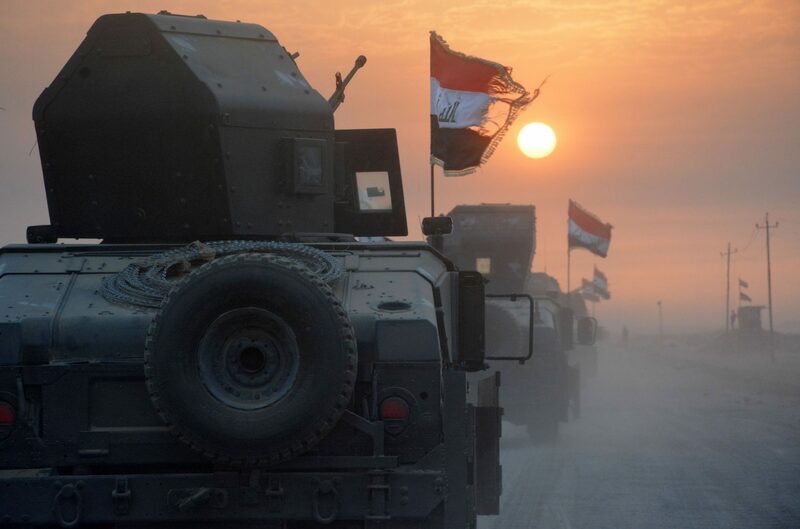 New tactics employed since the turn of the year, including a night raid and better defences against suicide car bombs, have given the campaign fresh momentum, U.S. and Iraqi military officials say. Better coordination between military divisions, such as the elite CTS and the regular army, has helped, a senior Western diplomat told Reuters this week. “As (Islamic State) are pulled away to fight CTS, that’s the opportunity for the Iraqi army to attack against a much weaker defence,” the diplomat said, adding securing areas along the Tigris would be crucial. In separate advances further south in the city, other CTS units reached the Second Bridge, also called Freedom Bridge, and the Old Bridge or Iron Bridge, across the Tigris, Numan said. Assaults on the western half of Mosul are expected to begin once Iraqi forces have secured the east bank. All the bridges have been hit by U.S. coalition air strikes in an effort to hamper Islamic State’s movements. U.S. and Iraqi military officials say Islamic State has further damaged at least two of them to try to hamper an army advance. The campaign involves a 100,000-strong force of Iraqi troops, Kurdish fighters and Shi’ite militias, in addition to air support by the U.S.-led coalition.